I know, I just announced this as if Prada had announced a new diffusion line. If you've been following Angloyankophile since The Beginning, you'll also know that I always make a stop at Denny's when I'm back in the States. At this point, I feel that it's very important to point out to my British readers that Denny's is a chain of diners that is about a step up from McDonald's. There isn't really anything special about it (truckers, watery coffee, bad perms - get the idea?) except for the fact that I'm slightly obsessed with their French Toast Slam: two pieces of cinnamon French Toast, two eggs (cooked over-easy, for me), two slices of bacon, and two breakfast sausage links. My stomach's grumbling now just thinking about it. HA! Having just seen The Hobbit earlier that week, I found this to be delightfully cheesy, embarrassing, and fun all at the same time (for the record, Justin ordered the Shire Sausage Skillet, which was ah-mazing. I don't want to actively encourage anyone to go to Denny's, but ...). I love how this happened in the States but would never, ever, in a million years, happen in the UK. 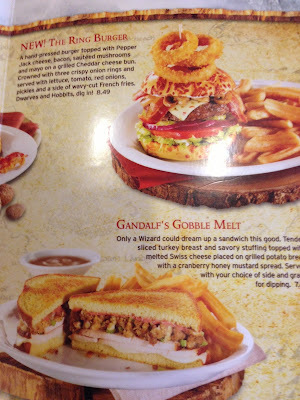 I mean ... Gandalf's Gobble Melt? I die. Waitress: "What can I get for you today?" Man (after much thought and deliberation): "Well, I guess I'll do the Hobbit thing. I'll have the Shire Sausage Skillet." The next best part was the fact that Justin received The Hobbit trading cards, since he ordered off of the Hobbit menu. Score. Oh Denny's! I'm heading to the Midwest at the end of the month -- bring on IHOP! Also, I just saw that my hometown is turning the defunct Damon's ~Steak and Sports Bar into a "Quick Steak & Lube". This is a chain restaurant. People eat food from that place. Crazypants. QUICK STEAK & LUBE?!?!?! Amazing. 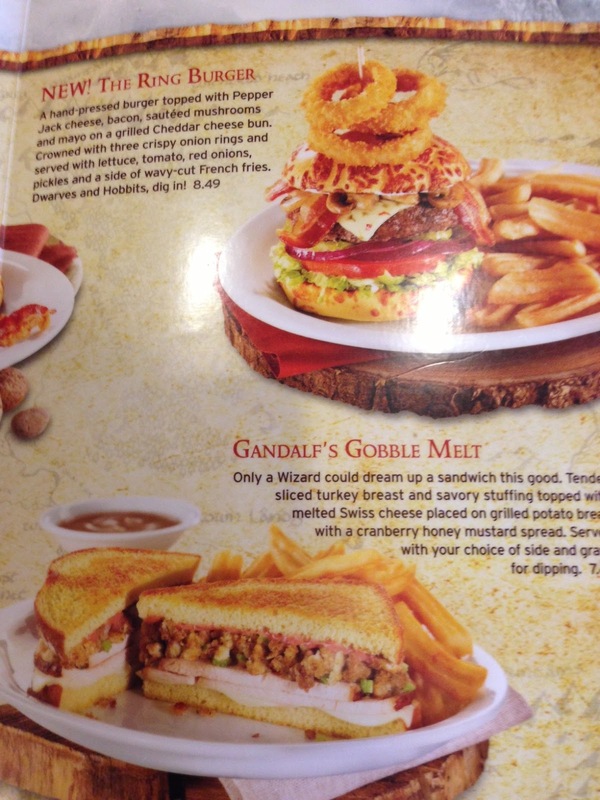 Gandalf's Gobble Melt eh? Thats where Little Chef went wrong haha! Sounds like the sort of menu that would be well recieved in a place like Brighton if no where else in the UK.